The ABCD Diaries: VeggieTales "Lettuce Love One Another!" 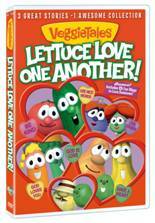 Review..
VeggieTales "Lettuce Love One Another!" Review..
VeggieTales: Lettuce Love One Another! includes three popular VeggieTales episodes—Tomato Sawyer & Huckleberry Larry's Big River Rescue, Abe and the Amazing Promise and King George and the Ducky—in addition to five brand-new “Bible Bits,” story shorts that demonstrate examples of giving and forgiving, helping, praying and sharing. Each episode in this collection helps teach a valuable lesson about love, whether it’s through honoring others when we help them, having patience or the importance of putting others first. What we thought: This was a really cute collection of VeggieTales episodes. The kiddos really enjoyed watching and continued to request it since Valentine's Day. I don't mind letting them watch it over again since the lessons are so important for them to learn and are presented in such a fun way:) ABCD Diaries gives "Lettuce Love One Another!" an A+! Mega Bloks Barbie Kits Party! Crafty Bands for Valentine's Day!